A lot of commercial advertisements on your browser’s window when you shop online usually mean that you have an adware application installed on your computer. SaveTogo Ads are one of these ads that are supposed to improve your overall web shopping experience. These advertisements are displayed by SaveTogo adware application, and the program is promoted as a useful tool that provides you with optimal online deals. However, it would be in your best interest to remove SaveTogo Ads from your computer, because constant pop-ups may eventually redirect you to potentially corrupted websites. Based on our security research, the main website for SaveTogo Ads can be accessed at savetogo.info. Nevertheless, unlike what one would expect from an official homepage, the website does not distribute SaveTogo app directly – there is not download link. It allows us to infer that the adware application is distributed bundled with freeware. It means that whenever you are about to download and install a video codec, a file converter, a shareware game, or a player upgrade from an unfamiliar website, you might be risking your computer security. After all, users are seldom informed when the likes of SaveTogo are installed on their computers. One might say that SaveTogo Ads are not dangerous and there is nothing wrong with having such application on one’s computer. Naturally, SaveTogo adware application is not a malware infection, but in the most extreme cases it might lead to one. The most common complaint related to such applications as SaveTogo Ads is slow web browser. Since SaveTogo collects information on your web browsing habits and displays various commercial advertisements, it significantly slows down your browser. The coupons and shopping offers that you see whenever you access online shopping websites can be extremely annoying and even dangerous! 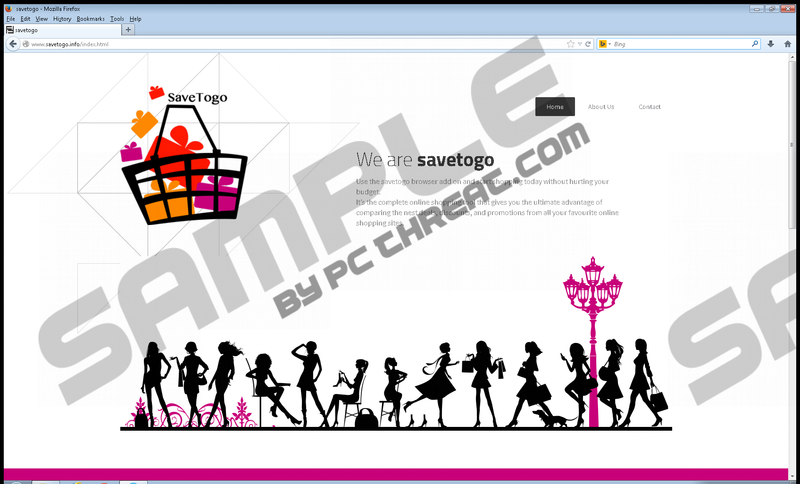 SaveTogo Ads do not intend to infect you with malware or expose you to corrupted websites on purpose. The application merely gets exploited as a vehicle by malevolent third parties to distribute their potentially corrupted content. And of course, the frustrating fact is that you actually allow SaveTogo Ads to enter your computer without realizing it. In order to delete SaveTogo Ads from your browser you need to terminate the application itself. It should be possible to uninstall SaveTogo via Control Panel. However, if you think that some potentially unwanted applications, files or key entries are left on your computer even after manual removal, you should scan the system with SpyHunter free scanner to determine what other files need to be removed. Then, invest in a powerful antimalware application, delete the potential threats automatically and protect your PC from other intruders in the future. Highlight SaveTogo and click Uninstall. Go to Uninstall a program and remove SaveTogo. Select Add or remove programs and uninstall SaveTogo. Quick & tested solution for SaveTogo Ads removal.